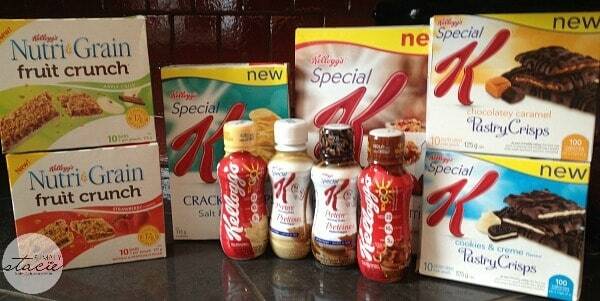 Kellogg Canada has introduced more new items in their biggest product launch to date! You may have already guessed that most of these items are for breakfast, but there’s a couple in there that are perfect for a quick snack fix to satisfy those hunger pangs. Check out the new cereal, shakes and snacks! Kellogg’s TO Go Breakfast Shakes in Chocolate and Vanilla flavours: A quick and convenient complete breakfast when time isn’t on your side. Each 296 mL serving is a source of 22 essential nutrients, 10g of protein and 5g of fibre. My favourite is the vanilla! Kellogg’s Nutri-Grain Fruit Crunch Bars in Strawberry and Apple Cinnamon flavours: A crunchy version of a Nutri-Grain bar. It has 17g of whole grain and are made with real fruit. Each individual package comes with two bars and make a great snack or quick breakfast. Both flavours were delicious. Special K Chocolatey Red Berries Cereal: Wholesome flakes, tangy berries and a sprinkling of chocolate is a perfect way to start your day…especially if you are a chocoholic! Special K Protein Morning Shakes in Café Latte and Mocha flavours: Satisfying morning shakes made with 10g of protein and 5g of fibre per serving. These are great for anyone watching their weight. The Café Latte tastes amazing! Special K Pastry Crisps in Cookies and Creme + Chocolatey Caramel flavours: A sweet indulgence for people managing their weight. They have only 100 calories for 2 crisps. Special K Cracker Chips in Salt & Vinegar flavour: Special K Cracker Chips are a lightly seasoned, savoury snack at only 80 calories for 18 chips. I think this is their best flavour yet! You can find these new products in your local grocery stores now and I encourage you to give them a try. Our stock is running low (and out for some) so I’ll be grabbing more on my next shopping trip. My favourite of the bunch is the Special K Protein Morning Shake in Café Latte. Coffee lovers will enjoy this one! The Chocolatety Caramel Pastry Crisps sound so yummy! I’d most like to try the Special K cracker chips. The Nutri-Grain Fruit Crunch bars. I would like to try the Special K cracker chips.